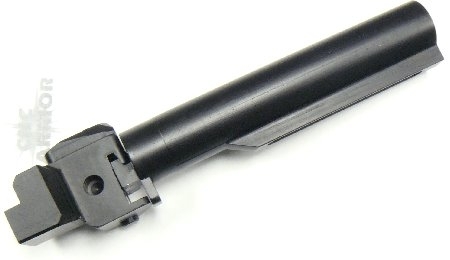 Fits stamped receiver MAK 90 rifles. NOTE: THIS SIDEFOLDING HINGE FITS MAK90 SQUARE BACK AND SLANT CUT RECEIVERS. Stamped receivers only. 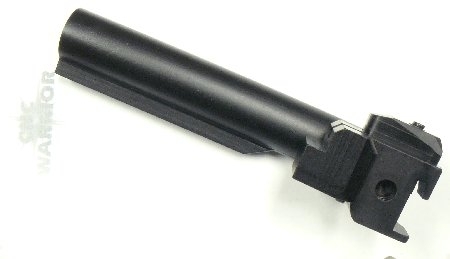 AR15 mil-spec buffer tube is included and attached to this hinge. Buttstock sold separately. Mating points are designed to lock up even tighter as wear ensues. Contoured to match your rear trunnion, this stock provides a nice factory look and installs without the use of any adapters and without requiring modifications to your gun. All models have an extra deep QD sling swivel pocket and finished in Class III black hardcoat. In coming months, we will be releasing several different “rear half” options, so you can swap your stock by simply pulling the hinge pin. No more bolting your stocks together. We are also working on “front half” options for many other popular rifles and shotguns.